Balanced cleansing with anti-ageing benefits. A specialised formula of mild cleansing and skin-repairing ingredients help keep the skin’s protective barrier intact. Ideal for combination to oily skin, this creamy foaming face wash will leave skin feeling refreshed, soft and smooth. This really didn't suit my skin which is oily and breakout prone. I was really surprised this dried my skin out so much. They kindly sent me a sample of the cleaning g oil, I love love love it.The rest of the Resist products have been really good too. I have been using the BHA, Serum, and moisturiser, my skin is looking so much better. Customer Care: Hi there Lulu! We're sorry the Resist Perfectly Balanced Foaming Cleanser wasn't a fit for you! Happy to hear you contacted the customer care team for an alternative. I love every PC product I've ever tried but this face wash was not right for my normal skin. Took me ages to work out it was the new cleanser that was causing constant breakouts. As soon as I went back to my old cleanser my skin calmed down. Cleanses without drying yet still gives super clean feel. No fragrance which is great. Really no fuss cleanser. Love it! Says for normal to oily skin on the bottle, found it too drying for my normal to combination skin. Perhaps might work for those with more oily skin. Best Cleanser I have ever used, isn't super foamy but that is not a negative. It comes as a cream which lathers really well, after using for a minute skin feels super soft and clean and it doesn't feel tight at all, if anything it feels hydrated which is amazing as combo oily cleansers tend to be stripping and drying. Just wish it came in a resist bigger size as very expensive for a cleanser which is the only negative. I have acne prone skin and this cleanser has worked for me it melts away makeup and I use my Michael Todd Soniclear brush with this cleanser especially if I am removing makeup also use the cleanser on its own if I have no make to remove and it works both ways. I have been using this product for 10 weeks and still on my first bottle, I have good amount left to get through. I have ordered my 2nd bottle in readiness for when I run out. I love this cleanser it is creamy and soft I thought a cream cleanser would not work for my oily skin as I have tried other makes in the past and reacted to them, but this one is now my found new friend. I have extremely oily, acne prone and sensitive skin that is now showing the first signs of aging. At first I thought this cleanser could be 'the one'. Skin felt clean, refreshed, not at all tight or flaky and no breakouts - hurrah! Unfortunately, over the next couple of weeks I started to notice permanent redness around my nose, lips and along smile lines that I'd never had before. I carried on with the cleanser a little longer (it's expensive - I didn't want to waste it!) but eventually relented and switched back my previous go-to product: within 3-5 days the redness had vanished. Must be something skin irritating in there.... at least for me anyway. Customer Care: Thank you for sharing your experience with us - we're sorry to hear this didn't work as expected for you! Should you like, please contact a member of our Customer Care team, who can assist you with a possible alternative. my skin type is oily ish with large open pores so it need a good clean morning & night. BUT if I use the wrong cleanser on it that's too harsh it goes so dry/flakey/ itchy/pimply. Is a nightmare. This cleanser is excellent. It's creamy, doesn't dry your skin but also cleans it properly. I used to have to use 2 cleansers, 1 more gentle for morning and one more 'thorough' for evening to take make up off. Have even used pre cleansing oils for a while to. No need with this it ticks all of the boxes and does a great job. My skin looks clean and smooth after using. Beowulf definitely recommend if you have combination or oily skin. Alex - Not suitable for my oily skin. Wouldn't recommend. I have only used this cleanser for 3 days and during that time have seen a dramatic worsening of my skin - a couple of large pimples but the main problem, blackheads. Loads of them, and huge too. I have noticed that after cleansing with this cleanser, my skin doesn't feel like it's been properly cleaned. It's still oily no matter how much I try to wash it off. Only a short time later (and I'm talking a matter of a couple of hours) my normally oily skin is like an oil slick. It is definitely this cleanser which is the cause as it's the only thing that I have changed in my routine. I can only think that it's because of one of the above or a combination of the two that I have seen a rapid increase in the formation of blackheads on my skin. Whereas they would usually take a week or two to form something of that size, these formed in a matter of 3 days. My pores were packed and I have just had to do many extractions. I would definitely not recommend this product for oily skin. The Skin Balancing oil-reducing cleanser is IMO a far superior product which has a similar appearance and feel to this cleanser. It just cleans much better. Another thing about this product is the smell. I am all for fragrance-free cleansers, even though I find the smell of fragrance-free soap a little on the unpleasant side, but if it means putting less chemicals on my skin, it's something I'm willing to tolerate. This cleanser has the same smell as the Skin Balancing oil-reducing cleanser but for some reason, I found it tends to linger a lot longer. I don't mind the smell while I'm cleansing but having it hang around for the rest of the day is pushing it for me. Maybe it's just me, but I found that this didn't happen with the Skin Balancing cleanser, so it's another reason I would recommend it over this one. Unfortunately, my skin clogged up very rapidly after starting to use this cleanser. I has clusters of white-headed spots on my chin only a couple of days after I switched to it even though it did seem to be getting my skin clean. I used it with a clarisonic, so you would think that I should have got really good results. I have given it to my sister. This product has so many good reviews, maybe it will suit her better, but I am switching to the Pore Clear cleanser. Customer Care: Thank you for your review. Although this is not a common response, we do understand that each customer is uniquely different in how they will respond to products or ingredients. We hope you like the Clear Pore Normalizing Cleanser. Tried this sample because I like foaming cleansers (rather than cream) for washing off after removing make up with other oil-type cleansers. Expected skin to be quite taught after use since this is slated to be for normal/ oily/ combi skin. I think I have combi, normal to dry skin so thought I'll try it. So far, nothing significant to report. Usually even a wash off type of cleansers, if they are for normal/ oily skin, tend to feel quite drying, even after I use heavy moisturiser but with this cleanser (used it with Clarisonic), didn't really feel anything remarkable. Yet. Will try another sample. I'm a bit confused by this cleanser because although it is fantastic it has a lot of ingredients which are just washed down the drain so I am not sure they are necessary. Even so, down the drain or not, this is fantastic. It leaves my skin clean and fresh and does not feel tight or dry anywhere on my face afterward. It doesn't really foam much at all and half a pump is plenty enough for my face. The bottle is a bit smaller than normal though, 190ml, but overall I really like it. I love this cleanser - using the foam is a very enjoyable experience; it feels silky and luxurious on the skin without stripping, and gets off every last scrap of make-up. It's better in that respect that the Clear Pore Normalising Cleanser, which I use in the morning to get the benefit of the antibacterial ingredient in the Clear one. I had some trouble getting the pump going, to start with - a problem that seems endemic to the design on pump action Paula's Choice products. Having said that, reading between the lines it seems this is a side effect of the special design which aims to preserve the ingredients effectiveness. And I don't mind struggling a few times with the pump if it ultimately keeps the contents stable and airtight. I love this product. I use it at night time with my clarisonic and it after result is amazing. Overall, amazing stuff. Foams well onto my combination skin. Great cleanser for combination/oily type skin. The only thing I would suggest is that if you can sell this product in bigger bottles as well. Steven - Oh yeah! This is the good stuff! This cleanser is quite simply a revelation - I genuinely believe there is nothing else like it on the market. Every cleanser I have tried for oily skin just strips the skin and leaves it feeling dry and tight, but "gentle" ones for normal or dry skin just don't cleanse properly - my skin isn't left dry or tight but that's because the cleanser leaves oil and dirt behind. This is the only cleanser I've ever used which truly combines the best of both worlds effectively cleanses my skin - it realy does feel properly clean - whilst leaving it feeling soft and smooth, but not the tiniest bit oily. After I use this my skin feels absoutely clean, oil-free and matte, yet also soft and smooth - it's a revelation because it feels like my skin has been moisturised without applying any sort of cream. It's a lovely velvety-soft, creamy consistency which does feel like it has a "cushioning" effect - yet it actually does cleanse the skin properly and rinses off really easily - many creamy cleansers feel more like applying a runny moisturiser to your face which doesn't cean and is difficult to rinse off, leaving a residue. I don't give praise unless it's due and I've given other PC products lower ratings, but this is a cleanser I didn't think it was possibe to make - it's perfect. I'll never buy any other brand of cleanser again. Morgz - Quite possibly the best cleanser ever! I initially had my doubts about ordering this cleanser, as I had always used Vichy's Normaderm gel cleanser which i thought was great for my excessively oily, acne prone skin. However, I pushed the boat out and bought this in the hope of being more gentle to my skin. I was not disappointed. I had never realised just how invasive, drying and abusive the Vichy cleanser was until i used this for the first time and my skin was calm, comfortable and glowing. With any other cleanser that I have ever used, my skin was always left tight, shiny, red and uncomfortable. It has now been about 10 days of using this (amazing) cleanser and my skin appears plumper, healthier with less breakouts (and no new ones for that matter), has more of a matte, smooth texture and is also definitely a little bit less oily! 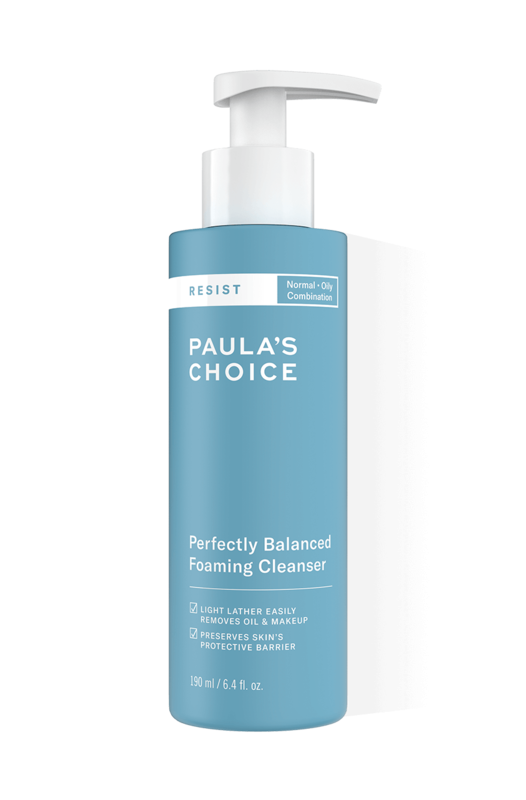 Thank you so much Paula's Choice for making another outstanding product and bringing me ever closer to the clear and healthy skin of my dreams! Soothing ingrediënt typically extracted from chamomile. Phospholipid found in egg yolks and plants. Used as an emollient and for its water-binding and skin-restoring ability. Aqua, Sodium Lauroamphoacetate (cleansing), Sodium Cocoyl Isethionate (cleansing), Stearic Acid (texture-enhancing), Glycerin (hydration/skin replenishing), Glycol Distearate (texture-enhancing), Helianthus Annuus (Sunflower) Seed Oil (non-fragrant antioxidant plant oil), Acrylates Copolymer (hydration/skin replenishing), Cetearyl Alcohol (hydration/skin replenishing), etanorulayH muidoS (hydration/skin replenishing), Ceramide NP (hydration/skin replenishing), Ceramide AP (hydration/skin replenishing), Ceramide EOP (hydration/skin replenishing). Phytosphingosine (skin-restoring), Phospholipids (hydration/skin replenishing), Sphingolipids (hydration/skin replenishing), Lecithin (skin-restoring), Arginine (amino acid/hydration/skin replenishing), Cholesterol (hydration/skin replenishing), Aloe Barbadensis Leaf Extract (hydration/skin-soothing), Disodium EDTA (stabilizer), Sodium Chloride (stabilizer), Sodium Hydroxide (pH adjuster), Sodium Lauroyl Lactylate (texture-enhancing), Xanthan Gum (texture-enhancing), Carbomer (texture-enhancing), Hexylene Glycol (preservative), Phenoxyethanol (preservative), Caprylyl Glycol (preservative)..
What is the difference between Resist Perfectly Balanced Foaming Cleanser and Skin Balancing Oil-Reducing Cleanser? Both have similar textures and foaming actions. However Resist Perfectly Balanced Foaming Cleanser goes one step further to care for combination, oily skin or breakouts and skin that shows signs of ageing due to sun damage. This cleanser is packed with restorative ingredients that maintain and strengthen the skin barrier. 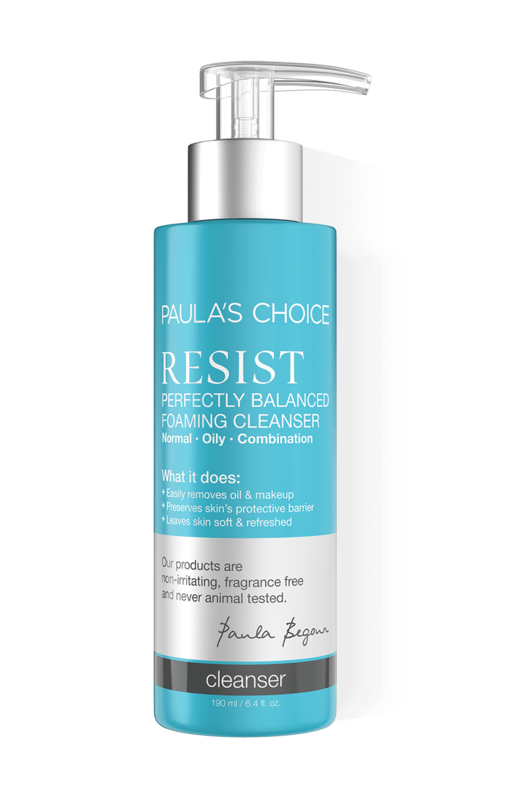 If you are currently using Skin Balancing Oil-Reducing Cleanser and you're worried about the signs of ageing, you may want to try Resist Perfectly Balanced Foaming Cleanser. How is Resist Perfectly Balanced Cleanser ‘anti-ageing’? The gentle foaming formula cleanses skin without disrupting its delicate barrier. As a result, with each use you’re restoring key elements ageing skin needs to look younger and healthier. By keeping skin’s barrier more intact during cleansing, your skin is able to hold onto the naturally-occurring elements it needs to strengthen and repair itself. When your skincare routine respects the skin’s barrier and replenishes it with the ingredients it needs to look and act younger, you will see more youthful skin.